To treat high grade ore Yanacocha implemented a milling process at the La Quinua operation. However, limited sites were available for the tailings storage facility. To best utilise the available area the tailings storage facility is fully contained within an active heap leach pad. Consequently high concentration thickened tailings are required to reduce the amount of water placed in the facility. 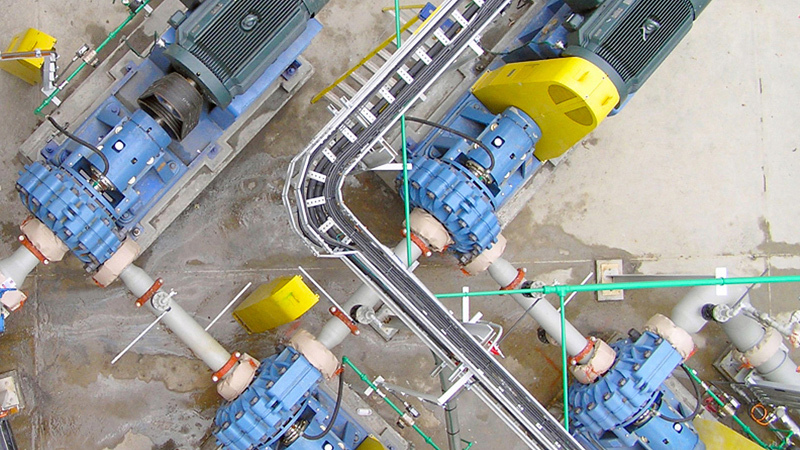 The tailings are thickened at the mill in a high rate thickener before being pumped to the storage facility by a train of centrifugal slurry pumps. Pipeline emergency flushing and shut down measures. Paterson & Cooke provided laboratory test work, trade-off studies, detailed engineering and start-up commissioning assistance and have since completed the design of the phase II pipeline expansion project. Kerr, TF, PD Duryea, W Grobbelaar and K Hackney (2007) “Design of a Thickened Mill Sands Management System within a Leach Pad”, Paste 07, ACG, Perth. Keevy, M and K Hackney (2007) “Pump Station Drive Selection Case Study”, Hydrotransport 17, SAIMM/BHR, Cape Town.